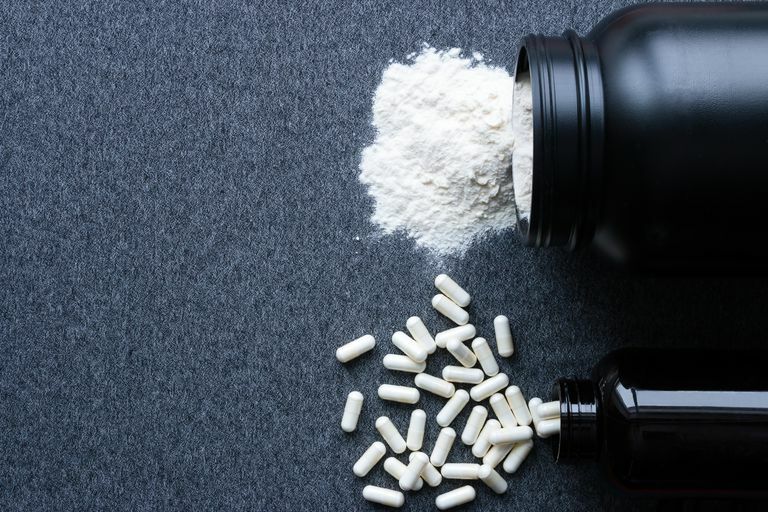 With caffeine anhydrous products gaining popularity at supplement stores, you may wonder if you should trade in your morning cup of joe for a caffeine pill. While caffeine anhydrous can help improve alertness and exercise performance, it’s not without risk. Taking too much can cause some scary side effects and even a potential caffeine overdose. Don’t panic though. The key to using caffeine anhydrous safely is selecting a quality product, avoiding pure powders, and being absolutely certain you stick to the correct dosage. Or, simply stick with natural caffeine like coffee and tea. These can be equally effective and present far fewer safety concerns. Caffeine anhydrous is derived from these plants. The other chemical components of the plants along with any water are filtered out in a laboratory. This leaves a white crystalline powder called caffeine anhydrous. The most common forms of caffeine anhydrous are pills and powders. However, the FDA advises avoiding any pure powders. There is a fine line between a safe and unsafe dose, and a small mistake in measurement could lead to dangerous side effects. In addition to standalone powders and pills, caffeine anhydrous is frequently used as an ingredient in various supplement categories. For example, you may find it in a pre-workout powder or in pills that claim to burn fat. Certain food products also contain added caffeine anhydrous, such as caffeinated energy bars or chewing gum. Dicaffeine malate – This is made of two caffeine molecules attached to a molecule of malic acid. Malic acid is an organic acid that is found in many foods you eat, like apples. Manufacturers of this ingredient claim that combining caffeine with malic acid prevent stomach upset, but this has not been proven. Caffeine citrate – This is a combination of caffeine anhydrous and two other chemicals—citric acid monohydrate and sodium citrate dihydrate. Caffeine makes up about half of the combination. Caffeine citrate is more commonly used for medical purposes rather than supplementation. In particular, it’s used as a treatment for a breathing problem among premature infants. Caffeine pterostilbene co-crystal – This is a combination of caffeine and pterostilbene, an antioxidant found in blueberries. It may be manufactured into several forms like capsules, tablets, or chews. Manufacturers claim that this form of caffeine creates longer lasting energy, but this has not been proven in scientific studies. Caffeine works the same way whether it's from a natural source or caffeine anhydrous. It's a sneaky impersonator of another chemical in your brain—a neurotransmitter called adenosine. When adenosine latches on to certain receptors in the brain, it makes you slow down and feel sleepy. That mid-afternoon lull that you hit? You can thank adenosine for that. But caffeine is structurally similar to adenosine. When you ingest caffeine, it attaches to those same receptors and prevents as much adenosine from binding. This keeps you feeling awake and alert longer. Does Caffeine Anhydrous Improve Exercise Performance? Caffeine—anhydrous or natural—is well established as a performance enhancer. Numerous studies and reviews have found that caffeine enhances endurance performance in activities like running and cycling. A meta-analysis in the Journal of the International Society of Sports Nutrition found that caffeine also improved certain muscular strength and power measurements. While there is no standardized approach to caffeine administration in exercise research, the large majority have used caffeine anhydrous capsules. In research, it’s easier to standardize a dose this way. Cups of coffee or tea can vary in caffeine content depending on the type and brewing time, but capsules provide an exact dosage. Don't rush out to grab caffeine anhydrous pills just yet though. Recent studies have attempted to clarify whether or not coffee can be equally effective for athletic performance as caffeine anhydrous. Since coffee is inexpensive and considered safer, it's a preferable choice for many. A study on elite male cyclists found no difference in the performance-enhancing effects of 5 mg/kg caffeine whether it was through coffee or through caffeine anhydrous. A review in the International Journal of Sport Nutrition and Exercise Metabolism concluded that there is moderate evidence supporting coffee as an ergogenic aid for running and cycling performance (when it provides caffeine in commonly researched dosages). While data is still lacking on other types of exercise, it appears that sipping on that brew before your cardio sessions will help give you that extra kick. Stick with a pre-exercise dose of caffeine (natural or anhydrous) around 3-6 mg/kg of body weight. Always start at the lower end of that range and find the minimum dose that helps you to achieve the performance boost. Keep in mind that doses over 6 mg/kg do not provide any additional benefits, and may cause side effects and safety concerns. Consume the caffeine about an hour before your training session or event. For a 150-pound athlete, a 3 mg/kg dose corresponds to around 200 milligrams of caffeine, equivalent to about two cups of coffee. If you decide to use anhydrous caffeine capsules instead, you can find many varieties on the market that provide this amount. Be sure to check the label to see the proper dosage, as levels can vary based on the manufacturer and product line. Whether anhydrous or naturally-occurring, caffeine is regulated by some athletic organizations. If you’re a collegiate athlete, you’ll want to tread carefully with caffeine intake. The NCAA currently restricts caffeine intake, using a threshold of 15 micrograms per milliliter in the urine. This is equivalent to approximately 500 milligrams of caffeine (or about 6 cups of coffee) consumed at one time. If you’re a professional athlete, you can breathe a sigh of relief. The WADA does not currently consider caffeine a banned substance. While it appeared on the list from 1984 to 2003, it was removed due to concerns that the threshold could not differentiate habitual dietary patterns (for example, frequent coffee and soft drinks) versus those using it as a performance enhancer. However, WADA does include caffeine on their “monitoring program.” This program is designed to track substances that are not currently prohibited but risk being misused or abused by athletes. It is plausible that it could be added back to the banned substance list in the future, likely at a threshold of 12-15 micrograms per milliliter in the urine. For most athletes though, use at the performance enhancing dose of 3-6 mg/kg should not produce urinary levels over this level. According to the Mayo Clinic and the FDA, most adults can safely consume up to 400 milligrams of caffeine. The European Food Safety Authority also supports this level of consumption, stating that single doses of 200 milligrams at one time and habitual consumption of 400 milligrams per day are considered safe for non-pregnant women. This safety level is applicable for either natural or anhydrous caffeine. A 400-milligram daily dosage of caffeine is equivalent to about four cups of home-brewed coffee, or two caffeine anhydrous pills that contain 200 milligrams each. Avoid pure powdered caffeine - As mentioned, the FDA recommends avoidance due to the ease of accidental overdose. A single teaspoon of pure powdered anhydrous caffeine is enough to cause potentially fatal consequences, as it's equivalent to 2700 milligrams of caffeine. To put that in perspective, you’d have to drink 28 cups of coffee, 68 cups of black tea, or 68 cans of cola to ingest the same amount of caffeine. Choose other forms and understand the dosage - Selecting another form of caffeine anhydrous, like capsules, should make it easier to stay within the safety guidelines. Take some time to check the bottles to make sure you understand just how much caffeine is in each pill. Look for reputable manufacturers - Good manufacturers put practices in place to avoid contamination with unwanted ingredients and prioritize supplement safety. Look for NSF or UL certifications on the bottles, both of which are independent third-party organizations that review supplement manufacturing processes. Always check with your doctor prior to beginning any supplement - Your MD will have a clear picture of your current medical conditions and medications, and will be able to tell you if there are reasons you should limit or avoid caffeine anhydrous. Your tolerance to different levels of caffeine can depend on your body size, typical consumption, medications, and even your genetics. If you start ingesting more caffeine than the recommended limits, you can experience side effects. You might feel a bit fearful seeing these side effects. Take comfort in the fact that it would be quite difficult to see any severe side effects with natural caffeine consumption in food and beverages. You can be confident in your normal dietary choices. If you decide to take caffeine anhydrous supplements, it's important to be aware that these risks exist. By taking the precautions mentioned above—like discussing use with your doctor and staying at a safe amount—you can minimize any risk. Yes. If you’re pregnant or breastfeeding, it’s best to avoid caffeine anhydrous completely. Don’t worry – you can still safely enjoy limited consumption of natural caffeine, like a cup of coffee or some dark chocolate each day. If you’re a parent, you’ll also want to have a chat with your teens about avoiding caffeine anhydrous. Many teen athletes start investigating supplement options for sports or general fitness. However, they may not understand the consequences of excessive supplement use, since these products are seen as “natural.” Be sure you help them realize that caffeine supplements can be dangerous. In addition, you’ll also want to avoid caffeine anhydrous if you’re taking certain medications. According to the Mayo Clinic, these include ephedrine, theophylline, or even herbal supplements like echinacea. Food & Drug Administration. Warning Letter to Smartpowders. 2015. Hodgson AB, Randell RK, Jeukendrup AE. The Metabolic and Performance Effects of Caffeine Compared to Coffee during Endurance Exercise. Earnest CP, ed. PLoS ONE. 2013;8(4):e59561. Grgic J, Trexler ET, Lazinica B, Pedisic Z. Effects of Caffeine Intake on Muscle Strength and Power: A Systematic Review and Meta-Analysis. Journal of the International Society of Sports Nutrition. 2018;15:11. Wickham KA, Spriet LL. Administration of Caffeine in Alternate Forms. Sports Medicine (Auckland, N.z). 2018;48(Suppl 1):79-91. Can These Supplements Help You Build Muscle? Should You Take L-Glutamine Supplements?